Thankfully, Apple offers iCloud service to back up our iOS data automatically, so that we can retrieve data lost due to this or that reason conveniently. If you are unlucky to lose some precious pictures and create frequent backups to iCloud just like Marry, you can follow these 3 solutions in the post to learn how to retrieve deleted photos from iCloud backup easily. Go to iCloud official website (iCloud.com) in the browser and enter your Apple ID and passcode to sign in iCloud account. Find Photos app and select "Albums" at the top menu bar. 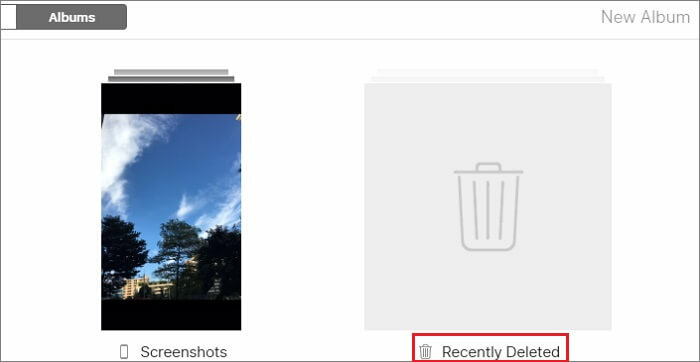 Choose "Recently Deleted" folder to see your recently deleted photos and then tap the "Recover" button to restore the selected photos. Note: Please try to recover the deleted photos you need immediately since the photos in "Recently Deleted" folder will be only kept for 30 days. After that, all the photos in this folder will be removed permanently. Simply go for the "Settings" > "General" > "Reset" > "Erase All Content and Settings" to clear all data and settings on your iPhone completely. Next follow the onscreen prompts to complete your iPhone settings. 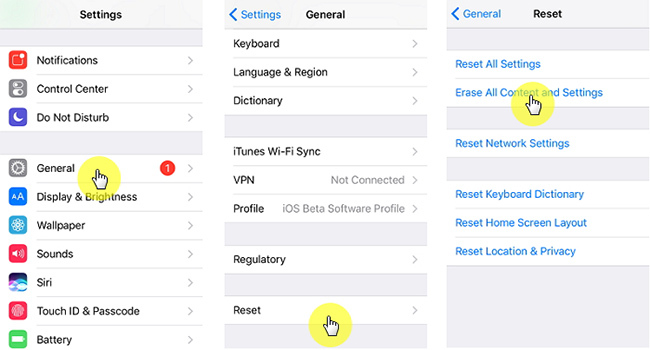 When it comes to the "Apps & Data" screen, choose the "Restore from iCloud Backup" option. Then log into your iCloud account and pick the most relevant iCloud backup and then tap the "Restore" option. Wait a while until the restoring process is finished. Note: 1. Please keep your Wi-Fi network connected during the restoration. 2. Back up your existing data on the iPhone before erasing all contents and settings to avoid data loss. If you didn't find lost iPhone photos from "Recently Deleted" folder, and don't want to erase your iPhone either, then Joyoshare iPhone Data Recovery can help you retrieve lost or deleted photos from iCloud on PC easily and securely. 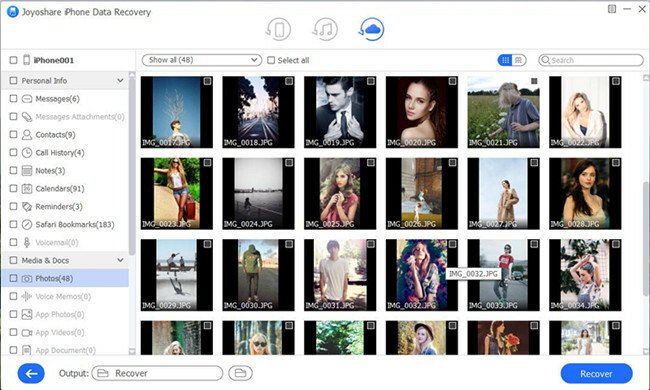 Besides, it also gives you liberty to preview and selectively recover photos you want. This remarkable iOS data recovery utility is able to recover up to 20 types of lost files including text messages, contacts, photos, videos, WhatsApp/Viber/Kik messages, notes, calendars, Safari bookmarks, etc. from iCloud backup, iTunes backup and iDevices as well. No matter how you lost your data, such as accidental deletion, system crash, forgotten password, etc, Joyoshare can salvage your data immediately with highest success rate. Next let's move to the detailed instruction on how to retrieve deleted photos from iCloud on PC with Joyoshare iPhone Data Recovery for Windows at every step. First of all, download Joyoshare iPhone Data Recovery and install it on your computer. Launch Joyoshare app and choose the "Recover from iCloud" mode from the top menu bar. Enter Apple ID and password to sign in your iCloud account. Please believe that Joyoshare will never keep a record of your private info and contents. Once you entered iCloud account, Joyoshare will detect all your iCloud backup files automatically. If not, you can add them by clicking the "+" button on the top right corner. Choose one iCloud backup that you think may contain the lost photos you need, and then click the "Download" button. After the downloading is done, pick the data types to recover, such as "Photos", "App Photos", etc. Then click the "Scan" button to allow Joyoshare to scan the lost or deleted iPhone photos from iCloud backup. The scanning process will take a while depending on the size of your data. Afterwards, you can preview all recoverable photos. Also, you can filter out the "Only show the deleted" or enter a keyword on the search box to search for a specific one. Hereafer, you can press the "Recover" button to retrieve all the selected iPhone photos and export them onto the local folder of your computer.